The All Progressives Congress (APC) yesterday picked majority of its national officers without rancour during its convention in Abuja. The intervention of President Muhammadu Buhari and high-wire consensus building by some governors and key party leaders, among them Asiwaju Bola Tinubu, averted what could have been a crisis over the filling of the offices. It was learnt that they were able to realign forces on over 40 out of the 60 National Working Committee (NWC) seats. Election into the remaining offices began at 5pm. It was ongoing at press time last night. The governors, according to The Nation, met far into the night on Friday and agreed substantially on the positions. Buhari and Tinubu were aware of what was going on. “Everybody sued for the unity of the party and agreed that sacrifice should be made by all in the interest of the party “, a governor told The Nation yesterday at the convention ground. 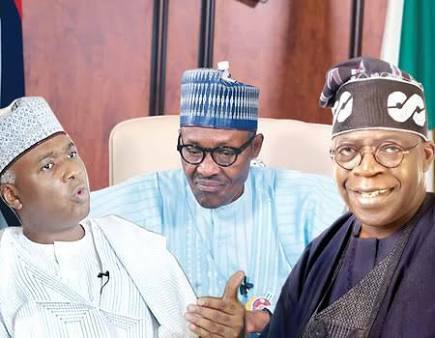 He said the unanimity of purpose in the party informed the decision of former presidential liaison officer Kashim Imam, who was backed by Tinubu, and Waziri Bulama, an architect, said to be the favourite of some members of the President’s camp, to step down for the National Secretary, Mai Bala Buni. Former Edo State Governor Adams Oshiomhole and 19 others had before the convention started, emerged unopposed as members of the new NWC. Some of those returned unopposed are Buni; former Ekiti State Governor Niyi Adebayo (Deputy National Chairman); Babatunde Ogala (National Legal Adviser); Pastor Bankole Oluwajana (National Vice Chairman, South-West); Ibrahim Masari (National Welfare Secretary); Jock Alamba (Deputy National Welfare Secretary); Tunde Bello (National Financial Secretary); National Vice-Chairman, North-Central and others. Imam stole the show when he led the way in stepping down for Mai Mala Buni. His action prompted the withdrawal of Bulama and another aspirant, Abdulrahman Terab, from the race. Also, the incumbent National Vice Chairman, Chief Pius Akinyelure, withdrew for Pastor Olajuwon. Another governor, who spoke in confidence yesterday, said: “Following intervention by the President, some of our leaders and governors, we were able to shift grounds on some offices. But those we disagreed on, we left their fate to the delegates to decide. “If you look at the scenario at the convention, there was much consensus building in the South-West, North-East, North-Central and even North-West on some key positions. The office of the National Secretary was a tough one to take a position on but the governors had their way because the North-East is too strategic in 2019 to allow political tension or division. Addressing the delegates, outgoing National Chairman, Chief John Odigie-Oyegun said he felt fulfilled that APC was waxing stronger. He said the hosting of the convention had proved sceptics wrong that the party would collapse. According to him, the Phase 1 of the APC has ended and Phase 2 has started. He said: “I look in front of me today. I look to my right and to my left and I feel a deep sense of fulfilment, a deep sense of inner peace. “If you read the social media and you read some of the headlines in our media, you will think that this is a party that was on the verge of implosion, that it has divisions within it that was fatal. But look around, what we have is a colourful and one happy family. I thank you all for this privilege. “Mr. President, I thank you specially for the opportunity to work closely with you and interact with you and for the support that you gave all the while. Oyegun thanked key APC leaders, including Asiwaju Tinubu, for making the coalition a reality. The APC, he said, would be a strong and passionate party in the years ahead. He added: “I will start with the key founding fathers of this party, Asiwaju Bola Ahmed Tinubu, Chief Bisi Akande, Dr. Ogbonnaya Onu, Prince Tony Momoh of the CPC. You were the key heads of the various political parties that accepted the idea of unity for the sake of this country and because of you all, including the later addition of nPDP and a faction of APGA, we are here today. “It is because of you that I look right and left and I see one strong party. I see a vibrant party, a party of passionate followers who are ready to follow our President because of the principled leadership in spite of the crude abuses, insinuations, fake stories that have been hurled in his direction, all of which he has not allowed to dissuade or distract him in any way from his course. “I thank my colleagues in the NWC, the chairmen of the various state chapters, some of who have returned to the saddle and will provide experience for continuity. “I thank my colleagues in the outgoing National Working Committee for the fantastic cooperation that I have received all these four years. “Yes, occasionally, our arguments were almost muscular but at the end of the day, we provided the kind of leadership that has brought this party to this point today, a strong party, a united party. “There were divergent views here and there. The essence is that the APC, is at the end of the day a strong party, a passionate party, a party that believes in its vision and the vision of the President for the vision of this country. Oyegun said he was leaving because the world is a stage and everyone is an actor with an exit date.